Few weeks before when it rained in the evening in Bangalore, cool air blew through the window while I was having tea along with my wife. It was raining after a long time. As I took a sip of the hot tea, I asked to my wife, "Do you like rain?" She Replied, "Yes I do. In fact among five seasons my favorite season is Rainy season"
I said to her, " But I never like rainy season, I love stormy rain in summer seasons." She said as she finished her cup of tea, " Yes I know about it, those are called Kal Vaisakhi." I asked, " Kal Vasisakhi ?" She said, "Yes, Kal Vaisakhi - Kal means 'Deadly' - Vaishakhi - Means 'of Summer'. Overall meaning a deadly storm of summer"
Saying thus she went to the kitchen for preparing dinner. But I sat there holding the emptied tea cup in one hand and looked out of the window. It was still raining and there was frequent crackle of thunder & lightning.It was altogether a different feeling. I was thinking to write something about it. But what I would write. I thought. Then I remembered me as a kid devoid of worries and responsibilities. 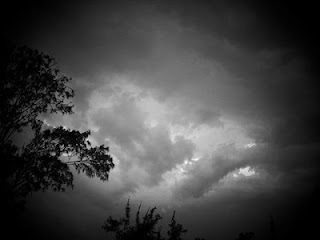 I would get excited when the sky get filled with monstrous dark clouds all of sudden on a hot summer late afternoon. The zig zag lightening that would last for a fraction of second among the clouds, crackle of thunder and the cool winds; I would watch all these from the door of our modest house in Bhubaneswar. I would rush to mother and hold her tight when 1st monstrous lightening would strike the nearby tree.My elder brother would giggle and tease me as Darpok - The coward fellow. But he would join me at the very next moment when another lightening would strike somewhere near. We both would cling to our mother and hide our faces in her sari. She would hold us tight in her both hands and assure us not to worry. She would say, " Don't worry I am here"
Those were her powerful words that still gives us courage. But she wouldn't say anything after that. I could see her worrying face. She would frequently look at the clock and peep outside and wish the lightening & rain would stop abruptly. But I would expect it should keep on going. But rain has its own will, it is not governed by our wishes. It takes its own time. When it would completely stop, she would go out and stand near the gate, While I and my brother would get busy sailing paper boats on the flowing water on the road. But she would stand near the gate and look the end of the road. All of a sudden she would shout at us, "Hay you both, stop playing, see your Baba (Father) has arrived from office." From a distance Baba would be walking to us by folding his pant sleeves up to the knee and holding his office bag wrapped in a polythene bag. He would be completely wet. We would eagerly run to him and say about the rain, lightning and our newly made paper boats. He would say to us, " Yes it rained heavily. It was a Kalvaisakhi"
She would see him with full Love. There would be a beautiful relieved smile in her face.